Several years ago we blogged about the Overington Mansion. As a young child I would listen to my older neighbors on Pilling Street gossip about the Overington’s and how beautiful the house was. So I wanted to know who the Overington’s were. Recently you received an email from Sandi Gammon about Overington Park and that she was pleased that the park was being cared for by the Frankford Garden Club. Her great grandmother lived there “Poppy Overington” So I had to get in with touch with her. We emailed each other and she has a website about her family tree and tons of pictures of the Overington’s and the mansion. I thought you and your readers would enjoy her new site. Please feel free and leave a comment on site. The link to the site is here and it has quite a few pictures that I have not seen before. This one below is a picture of part of the celebration marking the opening of the Frankford El in November of 1922. 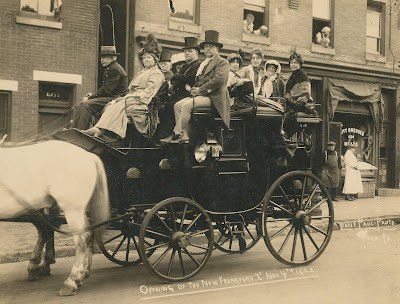 The Overingtons are in the group of people on the carriage. 15 Comments on "The Oaklands"
The pictures of the Overington House are beautiful. How wonderful to see this mansion in its glory days. And the pictures of some of the people who lived in the mansion was also a treat. Overington Park has gone through many changes over the years. But the park is beautiful now thanks to Diane and John and The Friends of Overington Park. When Dr. Benjamin Rush lived in Frankford, so did many of his wealthy friends; and they were all contributors to the Pennsylvania Hospital. “At a special Meeting of the Managers, Physicians, and Treasurer this day, at the house of Samuel Coates. I have a question. In the book “Frankford” They had a picture of the mansion that once sat near Leiper st. and Overington. In the book it said that the Overington’s tore that down and reused the bldg material for the new mansion at 4606 Leiper street. Did Robert Smith sell the first property to William Overington? What did William Overinton Sr. do for a living? William Overington was a land speculator. He became very wealthy due to an enormous volume of profitable real-estate transactions. He may have had other businesses. His many deed transaction range between 1809 to 1899, but that may also include a second William Overington, most likely a son. Robert Smith’s “Oaklands” was most likely the name of his whole estate consisting of 90 plus acres. Robert Smith purchased his farm on February 23, 1787, while his friend Dr. Rush was living in Oxford Township on Adams Road. Rush’s medical records will prove he treated Smith’s wife here in Frankford. Smith’s Land did have a building, but that does not necessarily mean it was the same mansion house that belonged to Overington, but it may have been (with new additions by Overington as seen in the old photos). This same parcel of land ended up passing through several hands until passed to Thomas Leiper. Thomas Leiper died and his family sold it to William Overington. I have spent several years doing deed searches to prove Benjamin Rush’s ownership of the Greenwood Property, or that house would be gone too, (I was not alone as I had a lot of help & two good teachers). That is why I am familiar with this area of Frankford & Northwood. Isn’t it nice to look at old pictures and be reminded of what a beautiful area Frankford/Northwood once was? And it’s not just Frankford/Northwood that has become run-down. Other neighborhoods in Philly that were once beautiful are decaying. Unfortunately the powers that be (beginning with Ed Rendell when he was Mayor) decided the only areas worth pouring money into is Center City and University City at the expense of other Philly neighborhoods. What a shame! Don’t just blame the politicians. People need to stop littering and clean up after themselves. Pilling Street still looks good as does Oakland street. Overington Park never looked better!! Why? People care like Friends of Overington Park.Take a walk over the park its so nice. Lets take care of where we live. Simple. Is Samuel Pilling buried in Greenwood Cemetery? Who knows where the Pilling Works Mill was located? Is the bldg still there? Any help would be great. J.M maybe? Never had a clue that Thomas Leiper owned that house or even Robert Smith. Did I read right that Samuel Pilling owned the house also or just the land? For some odd reason I believe that Samuel Pilling may be buried in North Cedar Hill Cemetery. I am still researching the various mill works of Pilling, Horrocks, Whitacker & Garsed. Glad you brought up the Friends of Overington Park. Hope you and everyone will come to our event this Saturday and bring your kids and grandkids for the chalk art contest. There will be food, refreshments and lots of fun. The event is from noon till 3pm. Please come! J.M thanks for the reply. I enjoy reading your post. I’m interested to read about the old mill works in Frankford. A clarification about who cares for the park: Overington Park is being cared for by the Friends of Overington Park with some much appreciated occasional help coming from volunteers who are members of the Frankford Garden Club. We’ve turned out from 8-10AM on Mondays for much of the summer. We particularly appreciate the efforts of John Neugebauer and John Funk who kept the young trees (donated by the Pennsylvania Horticultural Society) watered. They had to fill a large container with water from our underground connection and then push the water in a wheel barrow around the park to the young trees. Not a job for the weak and faint hearted! “The back wing of the house was built before the Revolutionary Way, when the property sprawled across 202 acres from Frankford Creek to Oxford ave. I believe the 202 Acres ran between Castor Avenue and Leiper Street from the Frankford Creek (which includes Adams Avenue) to Harrison Street. I know because I have a copy of the hand drawn survey from 1773. If you look on the corner of Harrison St., Leiper St., & Oxford Avenue there is a small triangle piece of ground with a stone obelisk Marker. This was the far corner of Frankford back in 1800. While posting here on Samuel Pilling, I discovered [rediscovered] one of Frankford’s lost heros, an architect named Louis Wernwag. “March 31st (1813) the Upper Ferry Bridge Company was authorized to build connecting turnpikes from the Lancaster road and the Wissahickon road, so as to open more direct routes to the bridge. The western section was afterwards opened, but not turnpiked. From the bridge westward it was in later time known as Bridge (now Spring Garden) Street. On the east side of the river the authority given permitted the turnpiking of Callowhill and Morris Streets as far as Tenth. April 28th the corner-stone of the bridge was laid by the Grand Lodge of Ancient York Masons, Past Grand Master Jonathan Bayard Smith officiating. This bridge was long a famous one. The chord of the arch was three hundred and forty feet four inches, being ninety-eight feet greater than the span of any bridge hitherto known. The rise of the arch was twenty feet, the elevation above the water was thirty feet, and the entire length of the bridge was four hundred feet. At the centre of the arch the width of the structure was only thirty-five feet. It gradually widened on both sides until it reached the width of fifty feet four inches at the abutments. The designer of the bridge was Lewis Wernwag, previously a resident of Frankford. His first work in the bridge-building line was at Frankford, over the creek, which obtained for him such a reputation that his plans for the Schuylkill bridge, though novel, were favorably considered.